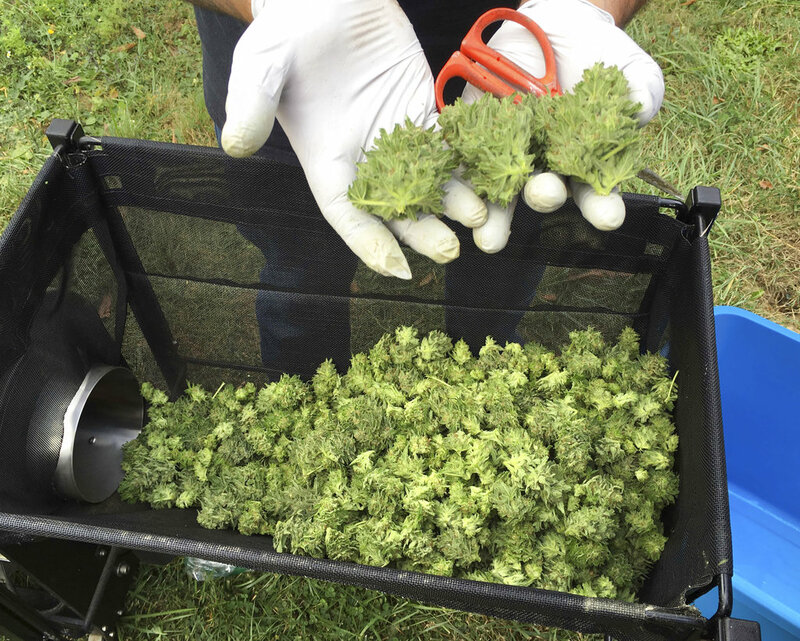 A marijuana harvester examines buds going through a trimming machine near Corvallis, Oregon. Three years after Oregon lawmakers created the state's new legal marijuana program, marijuana prices in the state are in free fall and the craft cannabis farmers who put Oregon on the map decades before legalization are losing their businesses to emerging chains and out-of-state investors. PORTLAND, Oregon — When Oregon lawmakers created the state’s legal marijuana program, they had one goal in mind above all else: to convince illicit pot growers to leave the black market. Now, marijuana prices there are in freefall, and the craft cannabis farmers who put Oregon on the map decades before broad legalization say they are in peril of losing their now-legal businesses as the market adjusts. Oregon’s Liquor Control Commission announced Wednesday they will stop processing new applications for marijuana licenses in two weeks to address a severe backlog and ask state lawmakers to take up the issue next year. The oversupply can be traced largely to state lawmakers’ and regulators’ earliest decisions to shape the industry. They were acutely aware of Oregon’s entrenched history of providing top-drawer pot to the black market nationwide, as well as a concentration of small farmers who had years of cultivation experience in the legal, but largely unregulated, medical pot program. Getting those growers into the system was critical if a legitimate industry was to flourish, said Sen. Ginny Burdick, a Portland Democrat who co-chaired a committee created to implement the voter-approved legalization measure. To encourage this transition, lawmakers decided not to cap licenses; to allow businesses to apply for multiple licenses; and to implement relatively inexpensive licensing fees. 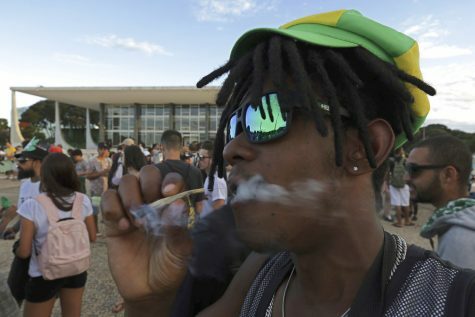 A young man smokes marijuana in front of the headquarters of the Brazilian Supreme Court, during a protest in favor of legalizing marijuana, in Brasilia, Brazil May 30. The decision to stop processing license applications comes after U.S. Attorney Billy Williams challenged state officials to address the oversupply. “In my view, and frankly in the view of those in the industry that I’ve heard from, it’s a failing of the state for not stepping back and taking a look at where this industry is at following legalization,” Williams told the AP in a phone interview. Lawmakers also quickly backtracked on a rule requiring that marijuana businesses have a majority ownership by someone with Oregon residency after entrepreneurs complained it was hard to secure startup money. That change opened the door to deep-pocketed, out-of-state companies that could begin consolidating the industry. Now, cannabis retail chains are emerging to take advantage of the shake-up. A company called Nectar has 13 stores around the state — with three more on tap — and says on its website it is buying up dispensaries too. Canada-based Golden Leaf Holdings bought the successful Oregon startup Chalice and has six stores around Portland, with another slated to open. William Simpson, Chalice’s founder and Golden Leaf Holdings CEO, is expanding into Northern California, Nevada and Canada. Simpson welcomes criticism that his business is to cannabis what Starbucks is to mass-market coffee. “If you take Chalice like Starbucks, it’s a known quantity, it’s a brand that people know and trust,” he said.